By Underground: Take the Piccadilly line (Heathrow Branch) to Northfields Station. On leaving the station turn right into Northfield Ave and walk for about half a mile on the same side of the road. 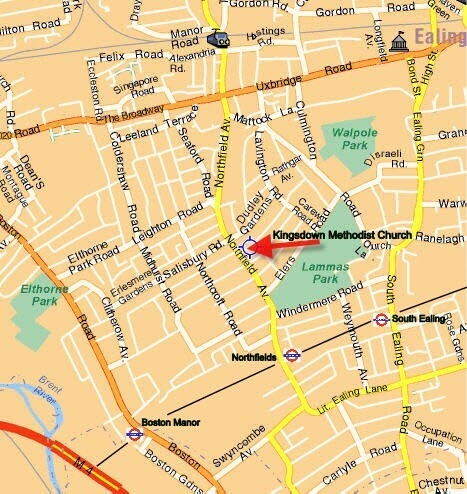 The Church is on the corner of Northfield and Kingdsdown Avenues. By Car: From the A40 leave at the Perivale/West Ealing turn off. into Argylle Road (B452) .Drive for about 2 miles without diverting. After crossing the Uxbridge Road (A4020) and driving along an avenue of trees, go around a slight bend and the church is on the left hand side of the road. From the A4 leave at the Ealing exit, into Windmill Road (B452). Drive to the T-junction at the top and turn right. At the next T-junction turn left into Northfield Ave.(B452) The church is on your right after 3/4 mile approx.